The missal presents texts for the celebration of the Mass. Most of the Mass remains constant throughout the year, but within it are read and sung texts which are unique to each day of the calendar, some of them from the Bible, some special hymns and prayers. This missal was produced in the 14th century for use in Hereford Cathedral. The mass that it presents was meant for a lay congregation as opposed to a monastery. Although by the 14th century much of the Mass was standardised, still it could vary from place to place. This manuscript can be identified as being of 'Hereford use' by the kinds of texts in it, the way they are arranged, and the saints whose feast days are 'red letter,' that is, written in red. Near the top of the left column word 'Iohan' in red indicates the beginning of a reading from the Gospel of John, which is then prefaced with the words 'In illo t[empore]' ('In that time'). The prayers and readings for Pentecost begin in the right column, under 'In die pent,' in red. The large decorated S begins the introit for Pentecost (?Spiritus d[omi]ne replevit...'). The introit is a prayer, usually based on fragments of scriptural text--from a psalm for instance--that would be sung with responses as the priest and attendants processed into the cathedral at the beginning of Mass. 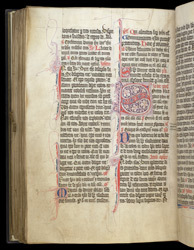 Farther down the left column, the title in red 'Actu aplox' indicates the beginning of the feast's reading from the Acts of the Apostles 2. In the left margins, a thick red flourish draws attention to each lection.